Jesse Cute on the set of the new "Double Dare" in Los Angeles. If you, like me, are a child of the 1980s or ‘90s, or a parent to one today, no doubt you know Double Dare as the outrageous, bright, loud game show for kids and starring kids that put Nickelodeon on the map and became a phenomenon like few other children’s shows in television history. It’s gooey, gross, and hilarious and it has a 30-plus-year legacy that began in Philadelphia. It’s still popular enough that it inspired a recent reboot and a full-on traveling road show that will slime up Philly for two nights this week. Double Dare Live! will give kids of the ‘80s and kids of today a chance to engage in the show’s epic challenges in person — complete with pies, goop, and Gak — Thursday, March 28, and Friday, March 29, at the Merriam Theater. Who am I? And what’s with me and Double Dare? I’m here to tell you a deep, dark confession. I am obsessed — yes, obsessed — with Double Dare. I’m a 41-year-old kid-at-heart public relations and marketing exec in Philly, and in between walking the dog, traveling the globe, and indoor-biking, chances are I’m on YouTube, watching clips of the show or on People.com, reading about the latest celeb to be covered in oatmeal. At age 13, I planned my own Kevin McCallister-inspired party-of-one trip to see Double Dare when it was taped at Universal Orlando (nixed by my parents). As a teen, I was always first in line at West Coast Video in Andorra to buy tickets to Double Dare’s live stage shows. I recorded (and logged) every episode of Double Dare on VHS tapes. I own an endless supply of Double Dare-branded swag: T-shirts, hoodies, mugs, pins, slap bracelets, pennants, hats, stickers, board games, beach balls, home videos, coasters, press kits, and dozens of publicity photos (some autographed). Oh, and socks. I’ve been a Double Dare contestant for Halloween three times. There are pictures from the show hanging in my bedroom. I’m told my latest living room redesign is, unintentionally, starting to look a little like the show’s set. “Dunkel Dare,” the annual Philly Beer Week homage to Double Dare at Frankford Hall, became a mandatory bonding activity for my office. I’ve traveled to L.A. twice for tapings at CBS Studios. I’m part of a Facebook group of like-minded fan boys (fan men?) who message one another throughout the show’s airings. My social media is adorned with obscure clips, rare finds, and groupie-like photos from the show’s history. I see Double Dare as a lingering remnant of my personal age of innocence. I was 9 when it debuted. Then and now, I find the show to be 30 minutes of good, old-fashioned, naughty-but-nice fun. It has in many ways remained the same in a world where so much has changed. Oh, and the kids: Kids are just funny. I don’t want kids. They’re inherently dirty, so when they squirm about getting slimed, egged, or gooed up, I just can’t stop snickering. I used to dream about the set: It’s a giant playground on steroids. An overload of colors, jagged shapes, and busy marquee lighting made the show magical. Today’s version honors the original in look and design with added LEDs and video screens. Obstacles like the Sundae Slide, Sewer Chute, and Gum Drop are oversize, overexaggerated, and over-decorated as a companion to the ridiculousness of their use. Finally, and above all else, it’s the people of Double Dare who make it so special. People who, through groupie fandom and loyalty, I’ve been able to befriend over these many years. People I text, people I lunch with, people I talk about like they’re my neighbor down the street. Marc Summers has a way of connecting with kids without talking down to them while making some deadpan side commentary only parents would understand. Both times I visited the L.A. studios for tapings and during his stint in Philly, he was kind enough to take time out of his schedule for lunch, when we chatted about (what else?) 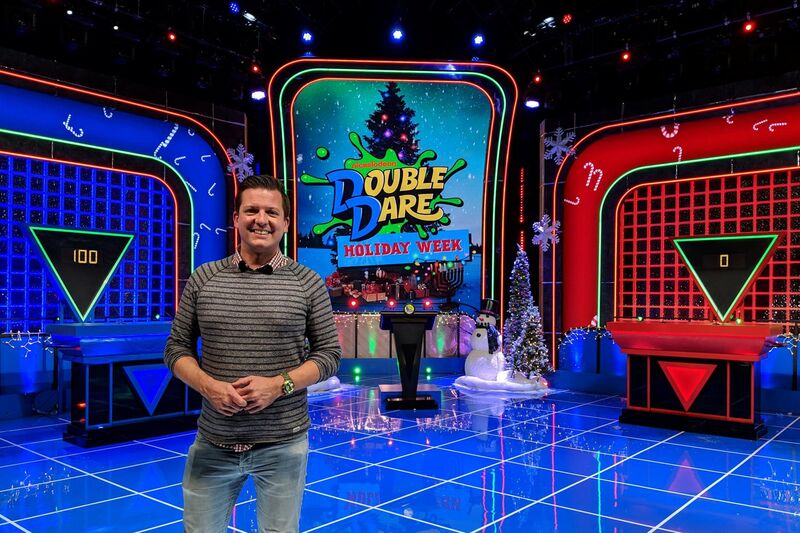 other game show reboots, behind-the-scenes goings-on at Double Dare, and, given his Food Network bona fides (he hosted Unwrapped, among other credits), the best places to eat all over the world. Robin Russo is my favorite. She was the Vanna White of Double Dare and took on a sisterly role with Marc that made the original show so much fun to watch. When Marc would tease or embarrass Robin, she would resort to some all-in-good-fun revenge by the next segment. Through groupie fandom, she’s kind of become a sister to me. As a kid, thanks to directory assistance, I once (or twice) called Robin to ask about the show. Now, we engage in Facebook banter where we find funny clips and post to each other’s walls. We text now and then, too, including our real-time observations on premiere night of the latest reboot or about her other fans — some of whom are incarcerated. I constantly remind her that I’m her No. 1 (and no criminal record). Speaking of the reboot, if you haven’t, check it out on Nick. The 2019 edition has put Summers, now 67, into a new role as “OG of the Double D” (trendy title for quality control) alongside new host and YouTube star Liza Koshy, who has brought in a new generation of viewers. Their “hip granddad/daughter” on-air chemistry seems to work. Have I managed to push your good feels button? Look for me geeking out in the front row both nights. 7:30 p.m. Thursday, March 28, and Friday, March 29, Merriam Theater, 250 S. Broad St., $39-$195, 215-893-1999, kimmelcenter.org.